Prototype: Swiss Federal Railways (SBB) class Re 4/4 I electric locomotive. Second production run in fir green basic paint scheme with TEE signs at the ends. 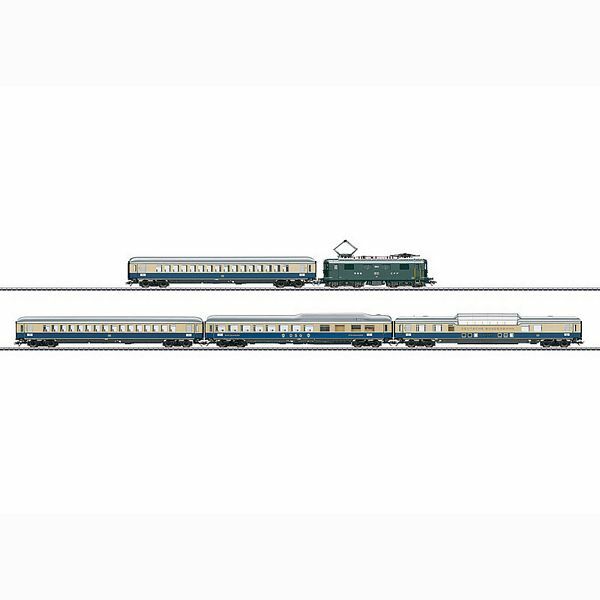 2 type Ap4um-62 TEE open seating cars, 1st class. 1 type AD4um-62 TEE vista dome car, 1st class, dome with 4 windows. 1 type WR4um-62 TEE dining car. All of the express train passenger cars lettered for the German Federal Railroad (DB) in the cobalt blue / beige "Rheingold" paint scheme. Train route as TEE 10 "Rheingold": Dortmund – Essen – Duisburg – Cologne – Bonn – Mainz – Mannheim – Basle SBB – Bern – Geneva. The train looks as it did in the summer of 1965. Model: The locomotive has an mfx+ digital decoder and extensive light and sound functions. It also has controlled high-efficiency propulsion with a flywheel. All 4 axles powered by means of cardan shafts. Traction tires. The locomotive has separately applied roof walks. It also has separately applied metal grab irons. The Swiss headlight code (triple headlights / white marker light) change over with the direction of travel, will work in conventional operation, and can be controlled digitally. The headlights at Locomotive Ends 2 and 1 can be turned off separately in digital operation. The locomotive has the "double A" light function. Brake hoses are included that can be mounted on the locomotive. All of the TEE express train passenger cars have factory-installed LED interior lighting. One open seating car is equipped with red marker lights and a pickup shoe. The entire car consist is supplied with power by means of the factory-installed current-conducting couplers. Maintenance-free warm white and red LEDs are used for the lighting. The TEE vista dome car has a dome from the second production run with 4 large panorama windows. The underbodies and skirting for the cars are specific to the types of cars. The trucks are Minden-Deutz heavy designs, prototypically equipped with double brake shoes, magnet rail brakes, and separately applied generators. Total length over the buffers 131 cm / 51-1/2".